My name is Lynn and my faithful companion is named Elsie. 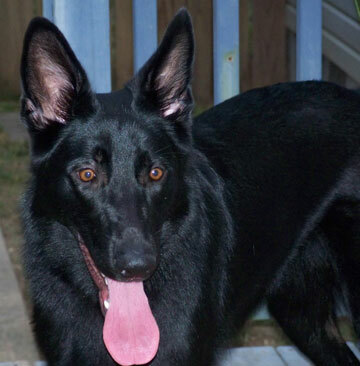 She is a spayed solid black GSD and will be one year old this month, November 19, 2011. I’ve included a photo taken of her at ten months old. I’ve always had the black and tans but when looking to replace my last faithful girl that I lost to age and hips I ran across a breeder who happened to have blacks in her line. I’d never seen them before (except in photos) and was totally in love. She looked like a little black bear cub as a little pup. The breeder imported her lines out of Germany. Elsie has been through two AKC training classes as a pup to ensure she is well behaved and is overall well trained. She is a wonderful young lady. I continue to practice her training on a daily basis as we go throughout her daily routines. She knows how to come (sometimes still selectively – still working on this), sit, sit/stay, down, down/stay, wait, stay, shake, touch, smell and go find, go to bed, sit/wait for her food, aht aht/leave it – take it, walk on a loose leash, quiet (most of the time) and retrieve. She is extremely attentive and intelligent. The AKC trainer stated that in his twenty some years of working with dogs he’d never met one so focused and willing to work (and she was only about 4-5 months old at that point). He fell in love with her right away. He encouraged me to follow up with agility training/competition with her, but due to a lung condition I simply don’t have the lung capacity to run around the ring with her. I call her the batgirl at times (she can still be wild and willy!). She is as loving and loyal as all of my other girls have been in the past. I couldn’t ask for a more loving and faithful companion! What a beautiful black GSD! Congratulations on your new baby. Losing a beloved pet is an ache in your heart and Elsie will fill that ache, just like my Mia GSD did for me when my beloved Ebony (lab) went to heaven. Elsie will become you protector, German Shepherds just have that thing in them. Enjoy new baby and cherish the moments! Take care of Elsie and she will take care of you! She is beautiful and looks just like a black wolf! I bet you get told that all the time.